Share the post "Album review: STEVE ROTHERY – The Ghosts Of Pripyat"
What’s a reviewer supposed to do when confronted by perfection? Our whole raison d’être here at GRTR! is to give an opinion that informs the reader; (a) whether the music being reviewed is worth a listen and (b) whether said reader is likely to find the music sits with their own musical tastes. So, what’s a reviewer supposed to do when confronted by perfection? ‘The Ghosts Of Pripyat’, a crowd-funded solo work by Marillion fretmeister Steve Rothery, is just one of those albums that is so good, so ‘of its time’ and so musically sublime that the word perfect is entirely apposite. The fact that it is both a ‘concept’ album and a completely instrumental effort should not deter those whose natural inclination is to run a mile when these words appear – moreover, it should be essential listening to anyone who enjoys great rock music brilliantly played. 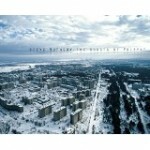 Telling the story, in soundscapes, of the deserted city of Pripyat, Ukraine, evacuated following the Chernobyl disaster in 1986, Rothery has given free rein to his creative imagination to paint an aural picture of a decaying city that is both sanguine and disturbing in equal measure. And he’s signed up some of the top names in progressive rock to help him out too. So the likes of Steve Hackett, Steven Wilson and Leon Parr are all on board, as are the Panic Room duo of Dave Foster (guitar) and Yatim Halimi (bass) – a statement of intent that this was going to be something special. Six of the seven tracks had been previewed on the triple disc ‘Live In Rome’ set released in 2014 so there was much anticipation for ‘The Ghosts Of Pripyat’ before its release; anticipation that has been fully realised with quite stunning effect. Seven tracks in all and finding high points is utterly futile as the individual tracks coalesce to form a wonderful, coherent whole – from the opening layered keyboards and chorus-pedal laden guitar of ‘Morpheus’ right through to the fabulous riffing of the closing title track, the picture is painted. There are pastoral acoustic passages, occasionally foreboding keyboard swashes, the odd bit of heavy riffing and plenty of chiming guitar arpeggios – all underscored by sublime electric guitar playing of the highest order. So many instrumental albums fall into the elephant trap of both tiresome repetition and over-indulgence – and none more so than in the sphere of progressive rock – but Rothery has sidestepped both by dint of both imaginative arrangements and peerless playing. And the playing from all concerned is absolutely superb, none more so than Rothery himself – his distinctive, warm and fluid style easily discernible throughout an album which will surely define the template for how these things should be done. Alan sequences “The Eclectic Mix” on Get Ready to ROCK! Radio, third Sunday of the month at 16:00. Expect some prog. This entry was posted in ALBUM REVIEWS, ALBUM REVIEWS (Mobile), All Posts, The Best of 2015 and tagged album, Dave Foster, Marillion, Panic Room, prog, Progressive Rock, review, Steve Hackett, Steve Rothery, Steven Wilson, The Ghosts Of Pripyat, Yatim Halimi. Bookmark the permalink.